The idea behind this new series is that when there is a mission that the more “public” team under Duke cannot take part in, the job goes to the Special Missions team, which includes Scarlett, Mainframe, Beachhead, Dial Tone, Deep Six, and Torpedo. And the team doesn’t exactly have access to the kind of resources that they previously enjoyed. It all makes for some great dramatic tension. As a fan of Scarlett and Beachhead specifically (I used to own the toys for both), this is a concept that I can really get behind. Chuck starts off this new series with a bang. We get the Baroness engaged in some off-the-book mission for Cobra and the Special Missions team engaged in a brutal city-fight somewhere in Libya. There is a lot of action in this issue, and it throws the reader straight into the middle of things. Usually, an approach like that can work, and its worked for me before, but since I’m not as caught up on these comics, I was confused as to the entire setup here, especially with Baroness no longer being a Cobra agent, Scarlet’s new team, and Serpentor being somehow subservient to Cobra Commander. I would have appreciated some explanations, perhaps even a roster of the team. Its all just about giving the reader enough to go on, especially since this is the first issue of a new series. However, I still had a blast with this issue. Chuck Dixon paces himself really well, and he clearly has a good handle on all of these characters. The way that the series has begun, I’m certainly looking forward to the next few issues. Where the art is concerned however, I think it could have been a lot, lot better. Paul Gulacy’s pencils are inconsistent. His Scarlet is drawn differently panel to panel and it gets really frustrating. 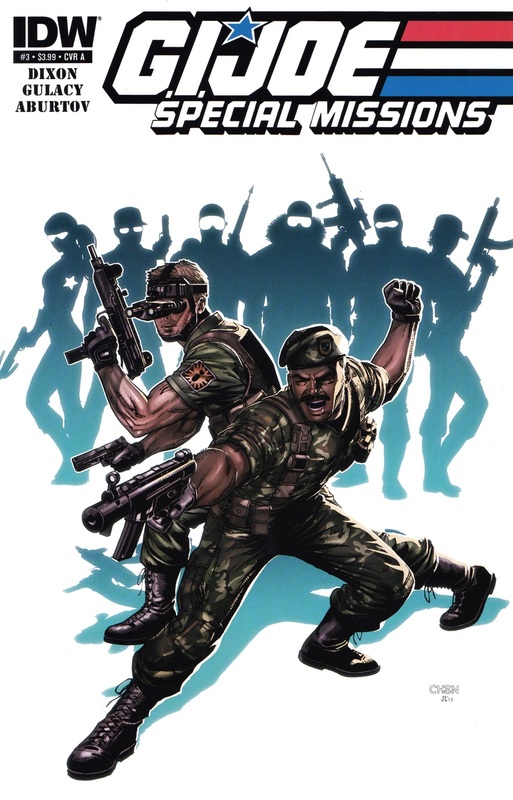 And in the panels with the G.I.Joe team in Libya, the characters have very thin waists, almost angular even in some of the panels. It is distracting and it takes away from the story that Chuck Dixon is telling. Aburtov and Grafikslava’s colours however, are pretty much spot on, and they give the issue a really nice and moody feel. Overall, I enjoyed this issue, but the art could certainly have been a lot better. Its mostly a matter of consistency and getting body proportions down right. With the second issue here, we get to see a lot more plot progression, whether is the Baroness’ attempts to get back into Cobra Commander’s good graces, the dynamics of the G.I.Joe Special Missions team, and the subplot involving Serpentor and the Coil. Chuck Dixon did a fairly good of establishing the new plot lines in the previous issue and he carries on rather well here too. But there are still a few negatives that prevent this issue from being great. Great like the previous work that Chuck Dixon has done for IDW’s G.I.Joe franchise. 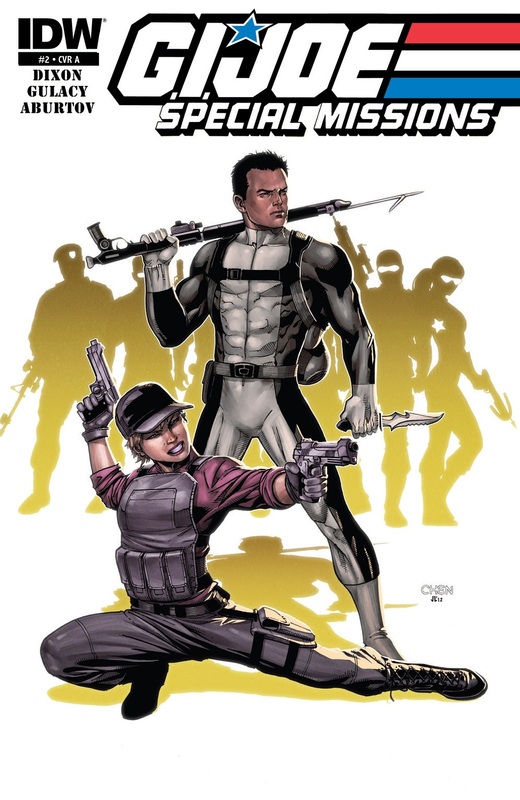 This issue is very much straight-up classic G.I.Joe action in that it brings a team together and sends off on a really crazy adventure against Cobra agents. That classic feel is what I really loved about this issue. And its all an underwater adventure, which just adds to the uniqueness of the book. But all the same, despite all the good bits, the story is too decompressed here and there is a lot going on here. There just isn’t all that plot progression other than for the subplot involving Serpentor and the Coil. That made it slightly hard to like this issue. And the cliffhanger was not a good place to end the issue at. It was an abrupt ending. One thing that really stood out, story-wise, was why Scarlett and Mainframe go on an underwater mission and not Deep Six and Torpedo, who man the sub. I mean, they are the underwater experts, the guys with the experience and the skills. Yet, we get the other two. Very confusing. The art is slightly better than the previous issue, but not by all that much. Gulacy’s Scarlet and Baroness continue to be inconsistent. The pencils in general are fairly polished and refined, but the panels lack details. Its all fairly straightforward stuff where next to nothing stands out or is memorable. Even the colours this time are not as impressive. I was just… disappointed. This could have been a great issue, but it wasn’t. After the disappointment of the previous issue, I lot a big part of my excitement for this series, but I decided to push on anyway. There’s no way that I can, when it comes down to it, resist a G.I.Joe comic. I’m too much of a fan for that. So I went ahead and picked up this issue, despite all the reservations. And what happened was that Chuck Dixon pulled a rabbit out of the hat. This was a really good issue, better even than the first issue, which had already been quite a decent one. The script really heads north for this one. There is lots of action, lots of suspense, and lots of drama. And we get some great plot progression as well on all counts, which I really appreciated. It seems that despite all the hiccups, Chuck is finally hitting his stride with this plotline and with the setup for this entire team and the characters here-in. Its all a continuation of his previous series, so that should be as expected, but he still manages to leave an impression. He does with this issue that wasn’t the case with the previous one: this was a memorable issue. Specifically, I really liked the setup of the entire conflict between Baroness and Serpentor’s Coil forces. And into that volatile mix are the G.I.Joes under Scarlet. So there is a three-way conflict brewing here, and while the ending of this issue really isn’t that much of a cliffhanger, its still a great place to end the issue. Its natural and it fits. One thing that I think could be improved upon is the interpersonal dynamic between the Joes. I’m not really seeing any kind of familiarity between the characters, aside from Scarlett and Mainframe being a couple now. There’s no friendly banter, no smack-talk, nothing that gets across the fact that this is a team where everybody is in tune with each other. That’s the biggest flaw of the series so far and I’m hoping it is improved upon. As for the art, same complaints as before. I’m just not getting the feel for the story at all because Gulacy’s pencils keep throwing me off. I’m not enjoying his art as much as I want to be. 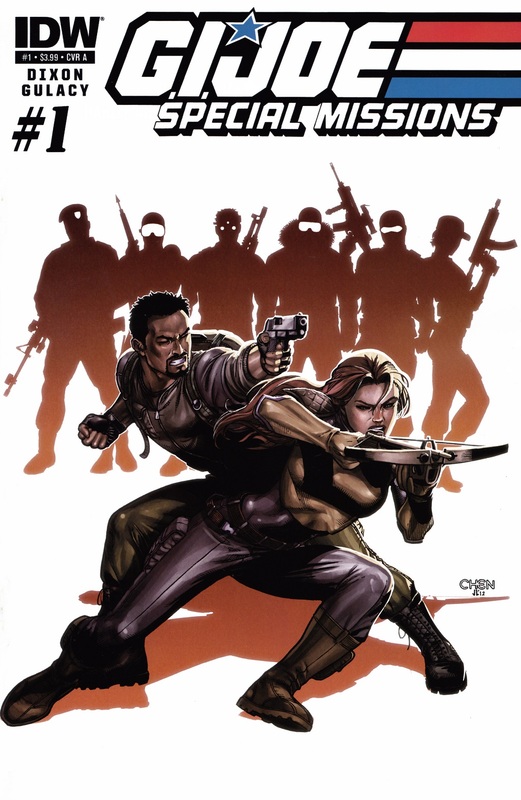 More G.I.Joe: (G.I.Joe) – Vol.1, Vol.2, (Cobra) Vol.1, Vol.2, (Cobra Command) Vol.1, Vol.2, Vol.3. Posted on September 24, 2013, in 2013 Reading Challenge, 2013 Writing Challenge, Challenges, Comics Reviews, Review Central and tagged 2013 Reading Challenge, 2013 Writing Challenge, Aburtov & Grafikslava, Challenges, Chuck Dixon, Cobra, Cobra Commander, Comics, Comics Reviews, G.I.Joe, IDW Publishing, Mainframe, Paul Gulacy, Review, Review Central, Scarlett, Serpentor, Shawn Lee. Bookmark the permalink. 3 Comments.